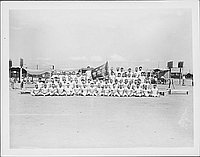 Group portrait of over fifty men of the Rohwer's Young Men's Association arranged in four rows on wooden bleachers in large open area at Rohwer concentration camp, Rohwer, Arkansas, 1942-1945. They wear white T-shirts wtih print across the chest, white pants, and headband. 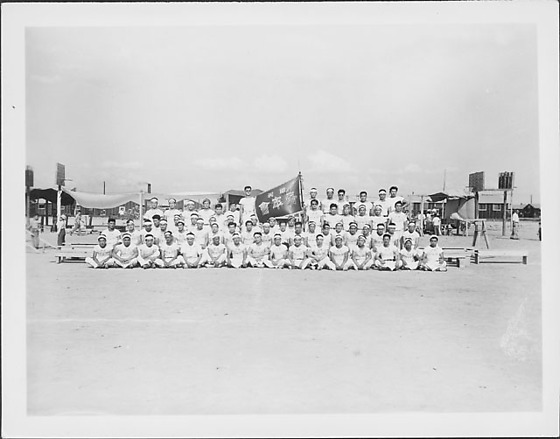 Two men in the C hold a dark flag with appliqued kanji characters, translated: Rohwer Young Men's Association. Several children and adults are visible under a canopied area in C background. Basketball hoops on backboards at CL and CR of background.